It's been a long time coming, but SuperPhillip Central has made it to its 500th review! In just over six years, we've managed to compile an exhaustive list of in-depth reviews for our readers to enjoy. Here's to 500 more! First, however, let's check out the subject of review #500. 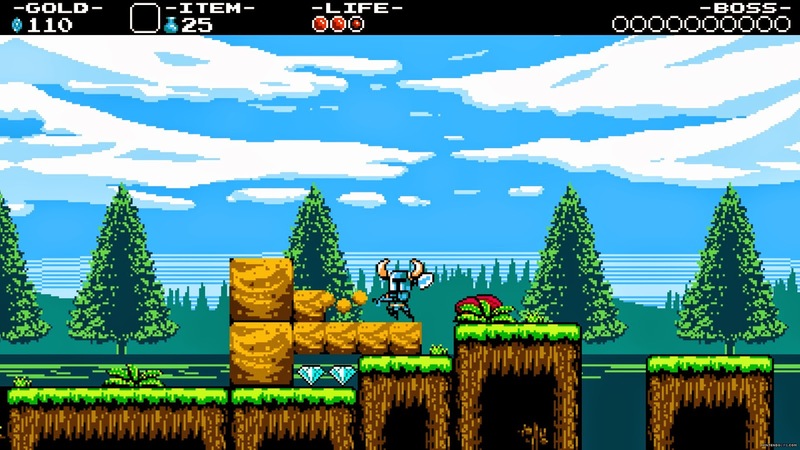 It's Shovel Knight, a Kickstarter-backed action platformer that takes inspiration from a myriad of classic gaming sources. Here's our review. The great kind of "shovelware"
Announced for Kickstarter early last year, it seems like we've been waiting eons for Shovel Knight to finally release. That could be because every time the release date approached, the game seemed to suffer a slight delay. 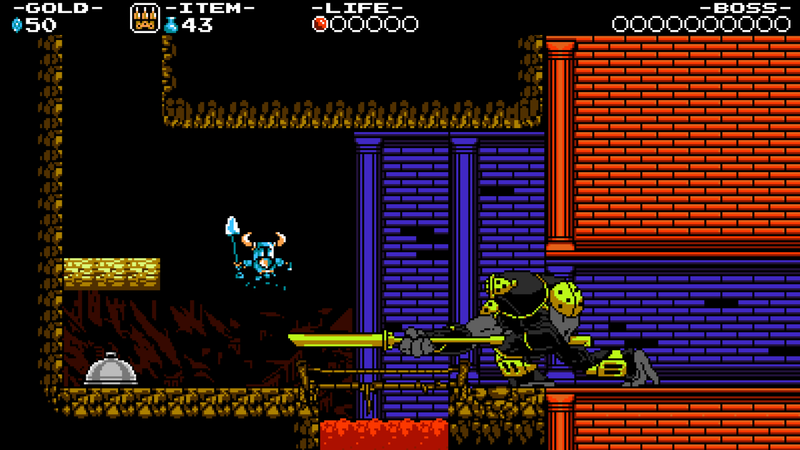 Now, Shovel Knight is out and in the hands of the reviewers and consumers alike. Was the agonizing wait for the game worth it? Prior to the events of the game, Shovel Knight and Shield Knight, fierce warriors who often fought together, explored the Tower of Fate. However, both succumbed to the evil energy within the tower. Once Shovel Knight came to, the tower is seen sealed and his beloved Shield Knight is trapped inside. A grieving Shovel Knight puts an end to his adventuring days and goes into seclusion, but in this time, the evil Enchantress rises, causing havoc and mayhem across the land. 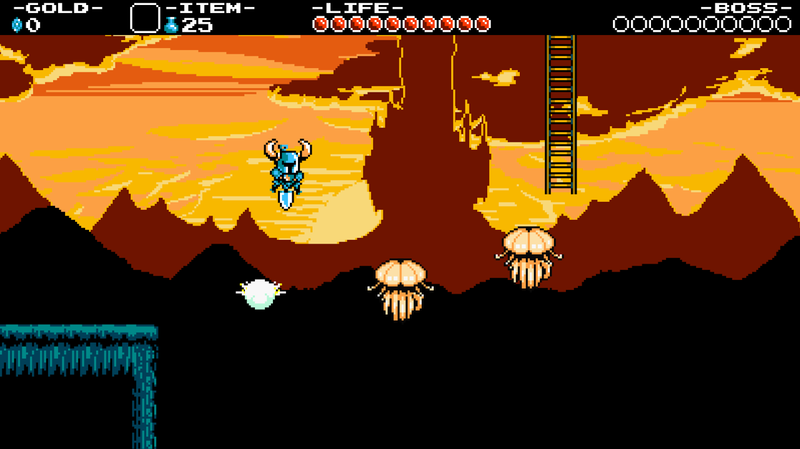 The Tower of Fate unseals in the process, leading Shovel Knight to unsheathe his shovel and return to the fight. of the game, as a good opening level should. Shovel Knight's tale may be simple much like the stories of the gaming era it emulates, but it achieves a plot that will make players want to see the end. This end is a greatly touching and heartfelt one that will make you applaud the execution of it. 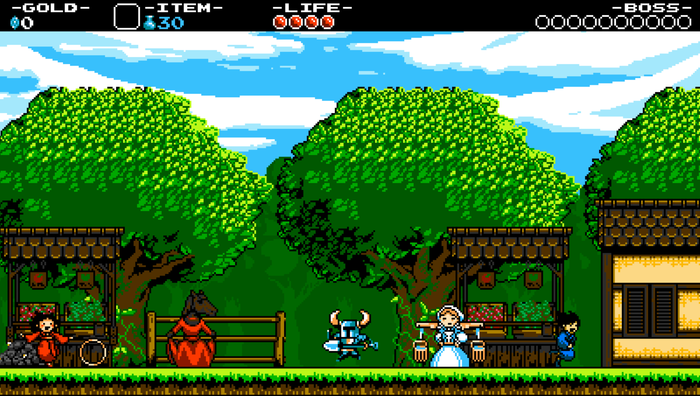 Shovel Knight is essentially a love letter to the 8-bit era of gaming. 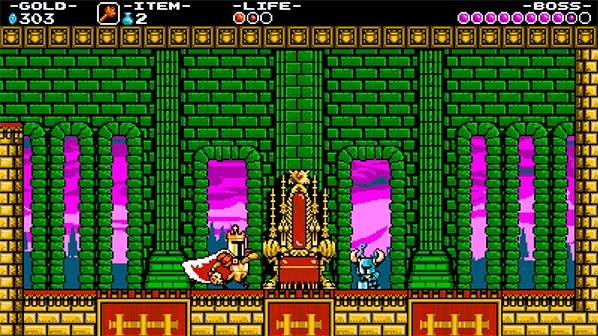 The game uses a strict NES-style color palette, levels are designed like similarly to the classic Mega Man games, and Shovel Knight can even use his shovel as a Pogo stick, a necessary tactic for some levels, like Scrooge McDuck in DuckTales. This is all topped with a presentation that would make the game fit perfectly on Nintendo's first home console, wonderful parallax scrolling, a catchy and inspired chiptune soundtrack by Jake Kaufman, and all of that without the sprite flickering that came with the territory of NES and Famicom titles. the game's duo of towns. Shovel Knight himself is a treasure collecting fool, breaking blocks, defeating foes, and open treasure chests. The gold earned from doing these tasks can be used to purchase helpful new relics (magic attacks that do various things), new armor, new shovel upgrades, and increases to his health and magic. There's never a Game Over screen to be seen. Whenever Shovel Knight dies, a portion of the gold he has on hand is removed. It can be collected once more if the player reaches the point where death took place, but die before reaching it and it's gone for good. However, gold is rather easy to accumulate throughout the game, so it's never an immensely harsh penalty. The level variety is amazing. Going through the game's various levels, each selected from a Super Mario Bros. 3-like world map, plays out like a Mega Man level. Each level is home to one of eight boss characters and has its own hook, accompanying obstacles, and hazards playing off said hook. Treasure Knight's level is a mostly submerged affair with anchors that rise and fall, perfect for platforming off of them, whereas Polar Knight's level features slippery platforms that are easy to slide off of for the uninitiated. The king will be dead. Outside of these eight levels, there's smaller challenge levels that each use one of the purchased relics throughout to create some dastardly challenges. The side content is there for those who wish to indulge in it, and that's a nice inclusion. Players will want to scour each level repeated times not just for gold, but also for Shovel Knight's only collectible, song scrolls of which there are about 45 to gather. These are placed in some of the trickiest to find and/or survive sections of the game, and finding all of them is a task that you can certainly pat yourself on the back for doing. Furthermore, if you REALLY want to pat yourself on the back or get that oft-coveted gamer cred, you should try to complete all of the game's feats. These achievements are unlocked for performing actions throughout Shovel Knight that you wouldn't ordinarily try to do otherwise. From beating the game in an impressive hour-and-a-half to completely a no-death run, Shovel Knight has tasks that are certainly not for the timid. This just further expands on the longevity of the game, and it's very much welcomed. Perhaps the only real issues with Shovel Knight is its length (taking but a handful hours to initially beat) and how it's not particularly ambitious. It's basically Mega Man with melee attacks instead of long-range buster shots. Regardless, at the same token, it's clear that Shovel Knight and its developer Yacht Club Games were really never striving to push the genre forward and meant for it to be a homage to classic 8-bit games. It's with this that the studio most certainly succeeded. 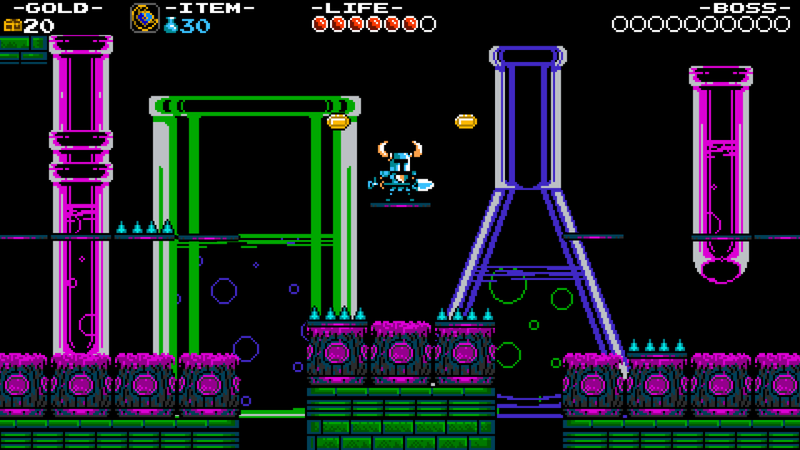 Shovel Knight plays perfectly and it really harks back to a more gameplay-oriented era in gaming. While it is definitely inspired by classics like Castlevania, Mega Man, and more, Yacht Club Games were able to victoriously give Shovel Knight a voice all on its own, and this voice is loud, proud, and intricately designed. Shovel Knight was without question designed with lots of love, designed with lots of passion for old school gaming, and designed from a gameplay-first philosophy. It's a game that any fan of action platformers will definitely dig.